Product prices and availability are accurate as of 2019-04-25 02:31:51 UTC and are subject to change. Any price and availability information displayed on http://www.amazon.com/ at the time of purchase will apply to the purchase of this product. **Please note that TrendsBlue is not responsible for other sellers selling a different, inferior quality, "made of pashmina" scarf on this listing. 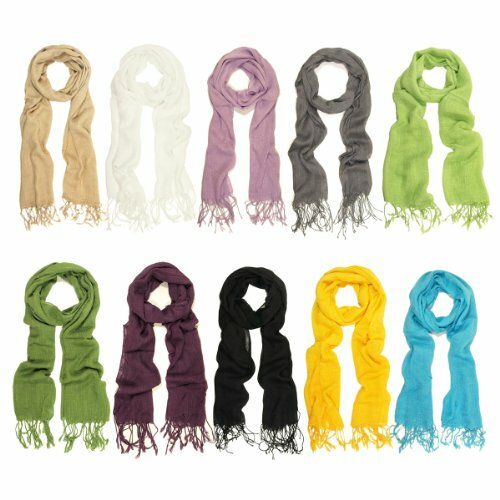 Our scarves are light weight & 100% Viscose as described and shown in the pictures. To ensure you receive the correct item, please make sure to buy from seller: TrendsBlue** TrendsBlue® is a registered trademark. This elegant solid colored scarf is a great addition to your collection of fashion accessories. Trendy and versatile. Thin and light weight, perfect for spring to fall seasons. Brings you simple & effortless style. This makes an excellent gift on any occasion. Size: Regular- 67" x 23" + 4" fringe. Large with frayed end- 80" x 49"